On April 30th at Books and Beans, Sheena Blackhall was inaugurated as the North-East's first ever Makar (Poet Laureate). Instigated by Gerard Rochford with the support of Aberdeen writers' groups and associations, this unique ceremony kicked off Wordfringe 2009 to an audience of fifty-four who were treated to poetry, song, humour and storytelling by Sheena, who has been publishing prolifically now for a quarter of a century and has notched up some seventy-eight volumes and countless appearances in literary magazines during that time. A long time for a screiver you might think — not for Aberdeen's first Lady of the Word whose pen never runs dry — our Siller Darlin' as we now and forever will call her. Keith Murray, who has enjoyed a long, rich and colourful association with Sheena, having published much of her early work, and continues to publish Sheena, among other publishers, through his small press Malfranteaux Concepts, talked of his fond memories of helping to establish Sheena as a writer who writes from the heart in the Doric thus preserving our native tongue in highly original and stimulating verse and prose. Keith also read a specially written poem in the Doric called Sheena Oor Ain — a tribute poem which he presented to her in a special glass frame. The evening also heard tributes and poems from Douglas Gray, Douglas Kynoch, who read from the bestselling book Fit Like Yer Majesty, and the usual open-mic session, somewhat thin on the ground this evening, but featuring the ever-maturing young poet Bryony Harrower whose work is of a very high quality for her sixteen years — watch this space! 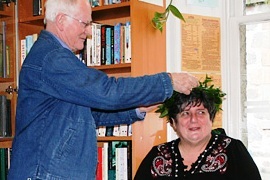 Gerard Rochford crowned Sheena Oor Ain Makar with a beautiful specially made bay-leaf crown. We wish Sheena good writing as our Makar o' the Nor East.